With a very American look and feel, All Star Slots Casino, as its name suggests, places a strong emphasis on slot play. Even the small but appealing range of bonuses is tailored for slot games, with few other games contributing to the wagering requirements. 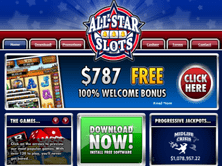 If you are looking for an All Star Slots Casino Bonus directly on the brand's website, you will find only a deposit match bonus of 100% up to $787. This deposit bonus is redeemable via a bonus coupon code ALLSTAR1, as are all the bonuses offered by this provider. 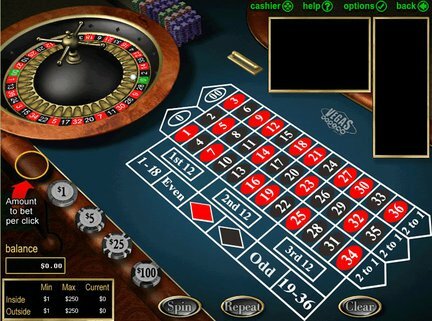 There are no free spins or no deposit vouchers available directly from the brand's web pages at this time. After your first deposit, you can get more free chips by taking advantage of the daily bonuses offered. This brand is not prolific in terms of the quantity of incentives issued and ceilings are quite low. In a direct comparison with Miami Club Casino, the promo arrangement can be seen to be very similar. What this brand does provide, which it's Miami themed competitor doesn't, is a superb mobile app enabling you to take your gambling wherever you go. The app is available for Android, iPad and iPhones. All Star Slots Casino allows players from the US to sign up for real money and this, along with the all American Theme has garnered great popularity with US-based internet gambling fans. A great number of Canadian players also rate this provider highly. Slots are a big deal at this gaming venue and Real Time Gaming is the software platform behind the playing experience. The entire range of Real Series Titles is here, with their random jackpots making them perfect targets for playing with your All Star Slots Casino bonus. If you do hit the big one, meeting your wagering requirements is unlikely to be a problem. If you're a lover of Video Poker, you will happy with the selection here. Favorite Video Poker games are Double Double Jackpot Poker and Bonus Deuces Wild. Table gamers haven't been left out, despite the emphasis on slot play. You can enjoy Baccarat, Blackjack, Keno and Sicbo. One of the more popular and less common table games enjoyed by members here is Red Dog. Information about named jackpot winners is scarce for this site. This is another brand which doesn't go much on publicity for those who win on its games. If a player should win big on one of the featured Real Time Gaming progressive jackpots though, you'll know about it. These jackpots are big enough to make the news in national and global media publications. All Star Slots Casino does list the current jackpot totals and at the time of review, there are certainly some potential big wins. For example, Jackpot Cleopatra's Gold is currently ready to release over $300,000 to a lucky winner somewhere in the world, while Jackpot Piñatas is brimming with a huge $1.75 million. Although the Club World Group, who own this brand, sometimes get some flak for controversial no deposit and bonus rules, this brand doesn't feature among the list of complaints. In fact members here seem to have only good things to say about the venue. Free spins and no deposit promo coupons and vouchers are honored without any problems and there seem to be few issues with cashing out. In light of this good record, this provider gets 4 out of 5 for complaints and handling. As mentioned above, the owner of this internet gaming establishment is the Club World Casino Group. Prior to being bought by Club World, this was a stand-alone brand. Some experts argued that the takeover was bad news, but in fact, no deterioration in quality ensued. The brand is licensed in Curacao and was first established in 2006. Club World purchased the brand in 2009. I love mobile gambling, I think it's the buzz I get from playing slots wherever I happen to be and knowing that just maybe I'm going to win big and enjoy a life changing moment while waiting for a haircut at the barber shop. So for me, the All Star Slots Casino mobile provision gets them near the top of my favorite providers list. I found the app download process, sign up and online play all worked flawlessly on my Android mobile phone, as well as on iPad and iPhone. The vivid, authentic sound effects and visual quality from RTG, as usual made me want to keep playing, especially when I switched to the full download software on my PC. I couldn't get enough of the Real Series with their random jackpot possibilities, free spins rounds and captivating themes. The fact that I was able to cash out a rather big win on Double Double Jackpot Video Poker probably biased my good opinion of this brand a little. However, there is no denying the maturity and solid service provided here. I rate this provider as 3 out of 5.